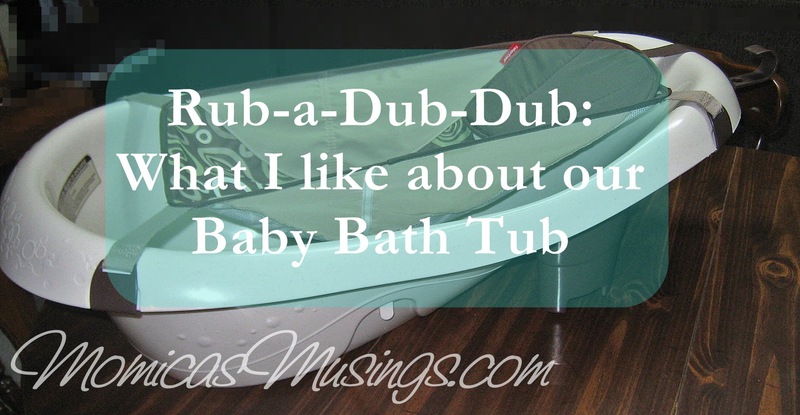 While I was pregnant and working on Baby V’s registry I spent quite a bit of time trying to choose a tub. I can get a bit overwhelmed by all the options available and eat up a lot of time researching items. I knew I didn’t want a pink or blue tub; I just wanted something neutral in color. The FP one is tan and brown so that worked for me. Through my research I was initially going to choose the Eurobath because of all the great reviews I found. Then I went and looked at it in person at the store. It was huge! It would be difficult/impossible to use outside of a bath tub. I was planning on putting the baby bath on a table for as long as possible (to decrease back cramps from leaning over the tub) until Baby V was older and ready to play in the water and then transitioning the baby tub into the big tub. 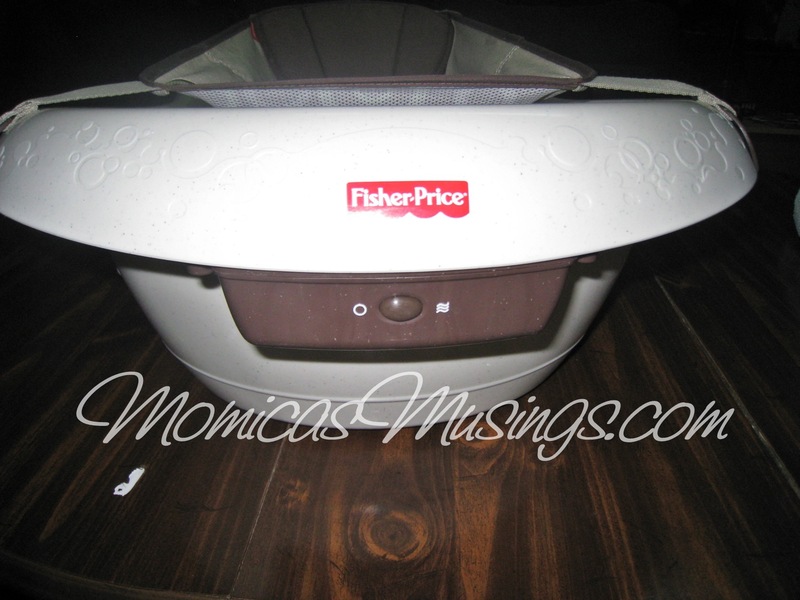 I ended up choosing the FP Calming Waters tub because I thought I would like the sling insert, however, I only ended up using the sling the first couple of baths. With two of us bathing Baby V, the sling just seemed to get in the way. Plus I saw a great video on bathing a newborn that suggested putting a towel in the tub to keep a baby from slipping and that works the best for us. For people bathing an infant alone, I think the sling is a great feature. The sling is also easily washable. I’m not sure how much it holds up on multiple washes since we only used ours a couple times. 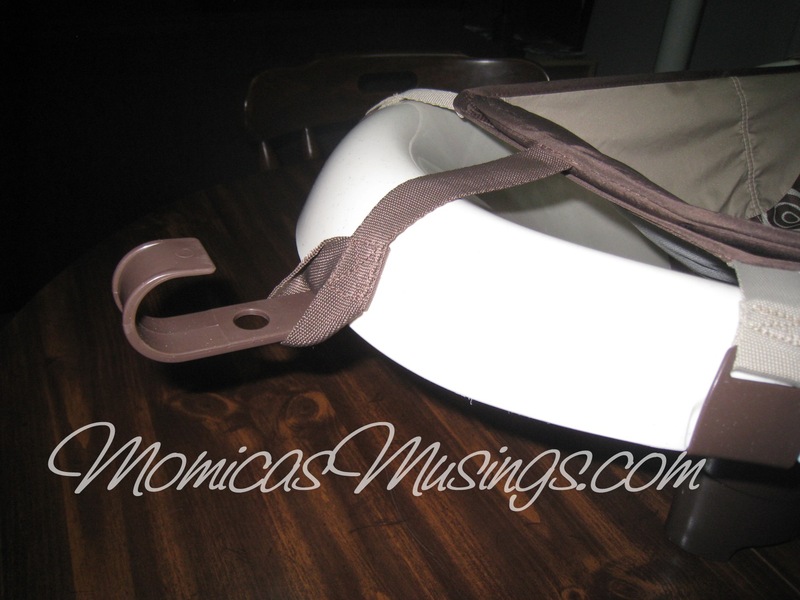 In addition to the sling insert there’s another small insert that can be placed on top of the sling to provide padding for your infant’s head. I didn’t find it useful so we didn’t use it. 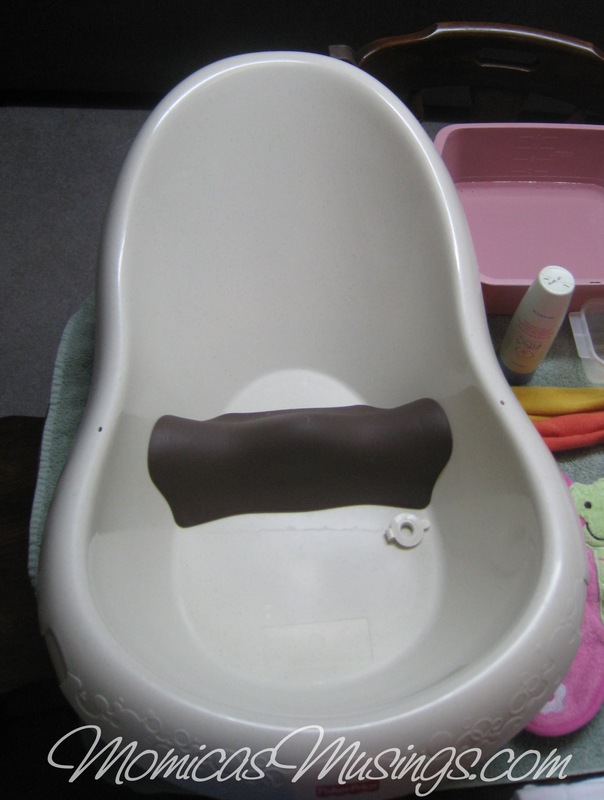 There is a baby stopper (brown bump) at the bottom of the bump that you can sit baby on so s/he doesn’t slip. 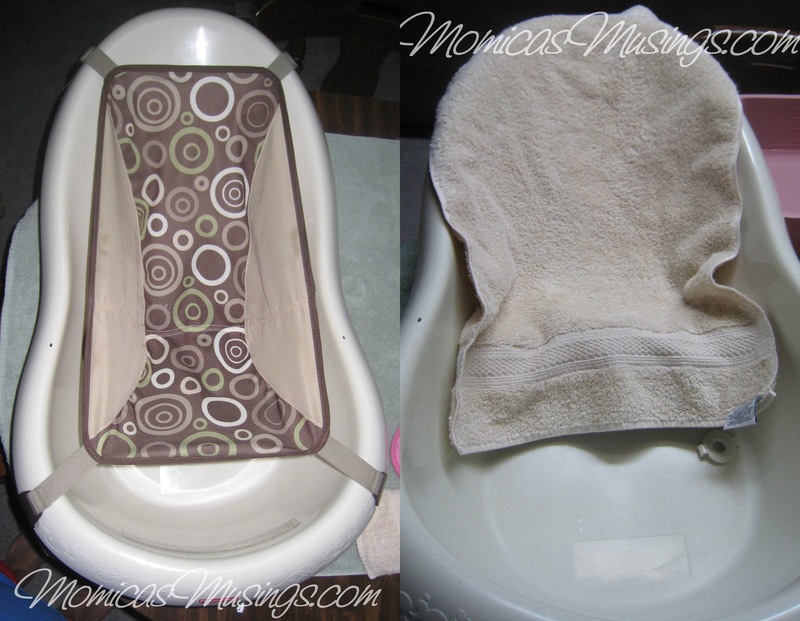 This feature is helpful for the newborn stage. We will be using this until Baby V can sit up by herself and wants to play in the water. As the name implies, there is a vibrating component to the tub, but as of yet we haven’t used that function. Baby V isn’t a huge fan of baths and we try and get her in and out fast! On the back of the tub there is a hook, so you could hang the tub up in your shower or laundry room to dry. We haven’t used this feature and just place it over our utility sink in the laundry room between baths. If cost was an issue I think an alternative tub could have been the Fisher-Price Precious Planet Whale of a Tub (now that I know what I like). Even though it is blue, it has the baby stopper and it’s a good price. Overall, I am very happy with the functionality of the Fisher-Price Calming Waters Vibrating Tub for our infant. We may need to transition to a different tub in the future, but this definitely works for us during this life stage for Baby V.
What has been your experience with baby bath tubs? Anything you like/dislike for the newborn/infant stage?